I just received an orchid plant without any instructions, don't know what type it is and have it in a large pot in a sunny spot in family room. There are 2 tree like stems, 15 inches tall, each has 2-3 lavender flowers blooming and are staked. Large leaves around base with strange looking pale colored vines growing beneath leaves. I would like to know general care,e.g., watering, etc. 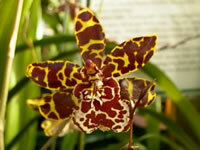 For many years most people considered orchids to be a 'greenhouse only' plant. Some varieties may be difficult to grow, and therefore best left to greenhouse culture, but there are many varieties which, when given the appropriate conditions and care will do quite well in a home environment. Unfortunately, due to the fact that there are over 1700 varieties of orchids, I will only be able to cover their basic, general care on this page. Contrary to popular belief, not all orchids require warm temperatures, in fact many do better with cool daytime temperatures of 60 to 70 degrees and 55 degrees at night. Others may take up to 80 degrees in the day and a drop to 65 or lower at night. Since orchids tend to be rather expensive compared to most house plants, make your choice of these beautiful plants wisely, and according to the conditions which you will be able to provide. Most orchids which are suited for home culture are epiphytic jungle plants (in nature they grow perched high in the trees, clinging to branches or in the trunk apex of the tree). They derive their nutrients from the air, rain, and any decaying vegetation which the roots can contact. For success you will need to duplicate the native conditions as closely as possible. 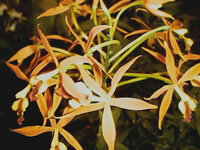 Orchids need high humidity of at least 50%. It is almost a necessity for the pots to be positioned above a tray filled with pebbles and water. The orchid pots themselves shouldn't set directly on the pebbles though, because excellent drainage is essential. It is best to invert a pot over the pebbles and then use that as a stand to set the orchid's pot on or hang the orchids above the tray. Misting the foliage is very beneficial, but this should only be done when there is sufficient light and air circulation so that the plants have a chance to dry before night. 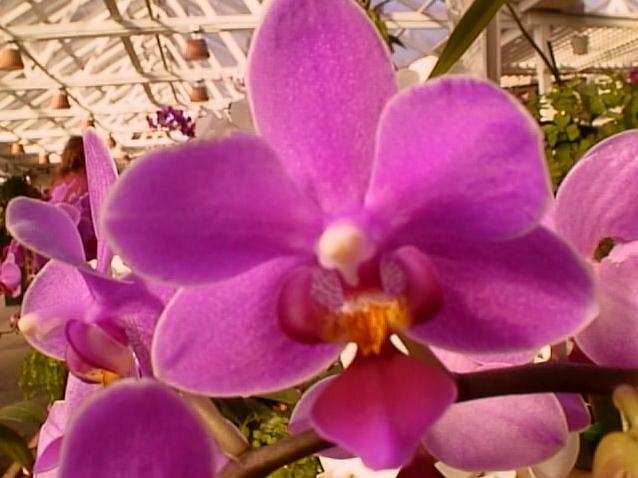 Orchids should be watered about once a week when the soil becomes dry, but they must never be allowed to remain wet or soggy for more than a day or two at a time. It is best to use water which has been allowed to sit for 24 hours to allow the chemicals to dissipate, and always at room temperature. 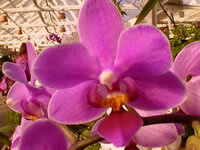 Feed your orchid with water soluble 'orchid fertilizer' every two weeks during the growing season. 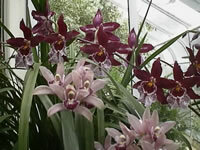 The light requirements for orchids vary with the individual plant. Four hours of sunlight is about the minimum required during the winter months if you want your plants to thrive and bloom for you. In the absence of natural sun you can provide the necessary light with the use of flourescent 'grow lights'. The 1200 foot-candles of light can be produced with four 48 inch grow lights suspended 6-12 inches above the plants. The lights should remain on for 14 hours each day. I recommend using ready made orchid potting mixes which are available from most garden centers or from the orchid growers themselves. This is mainly because of the ease and availability, it is fairly inexpensive, and it is blended to the proper texture and acidity. If you desire to create your own mix, it can be a combination of any or all of the following components: osmunda fiber, ground tree fern stem, or ground bark.